In preparation for the Tennessee State Museum exhibit, Slaves and Slaveholders of Wessyngton Plantation, descendants have been asked to locate Wessyngton artifacts, photographs, paintings and other memorabilia. A descendant of the owners of Wessyngton living in Nashville recently discovered this photograph in an album that belonged to his grandmother. The photograph was taken at Wessyngton in 1903, featuring Jenny Washington b. 1830, (wife of Allen Washington), Emanuel Washington 1824-1907 and his sister Susan Washington b. 1821. When the photo was taken there were only five former slaves still at Wessyngton of the senior generation, which also included Henny Washington 1839-1913 and Aggy Washington Terry, b.1824. My story began when I was in the seventh grade. 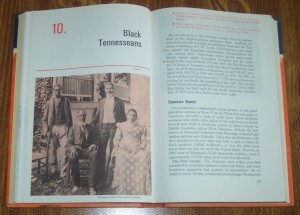 While flipping through my social studies textbook I spotted a photograph of four former slaves, entitled “Black Tennesseans.” For some reason I kept being drawn to the photo and would look at it each time I went to class. 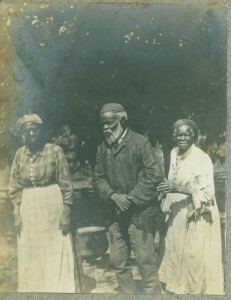 Soon afterwards my grandmother told me that the two people seated in the photograph were her paternal grandparents, Emanuel and Henny Washington, who were enslaved on Wessyngton Plantation. That discovery led me on a thirty year journey of researching my family and all the others connected to the plantation. During the late 1890s and early 1900s the Washington family commissioned [Maria] Howard Weeden to paint the portraits of several African Americans who were once enslaved on Wessyngton Plantation. One of them was of my great-great-grandfather Emanuel Washington. 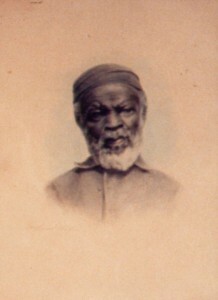 During the Civil War Emanuel ran away with Union soldiers. He and his family returned to Wessyngton after the war. Emanuel was famous for telling ghost stories to all the children on the plantation. He was born at Wessyngton April 23, 1824 and died there in 1907. His portrait remains in the Washington family.